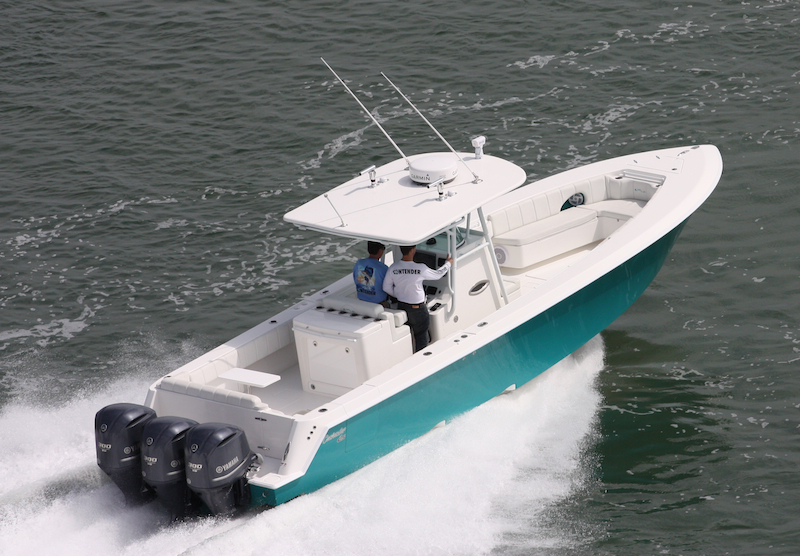 Below the waterline, the all new LS Series is an offshore animal built for rough water and big seas. Above the waterline she boasts a more luxurious feel with large standard aft seating and a spacious standard bow seating that invites your friends and family onboard. The bow seating arrangement features a standard hydraulic lifting sun pad and table while maintaining its sleek deck appearance. The bow seating provides ample storage space for all of your gear, and is incredibly comfortable for when flipping through the pages of your favorite literature. Ready to layout in the rays; simply push a button and the bow filler cushion rises to a flush seating level to make for a sunbed. Also, the sunbed transforms the lounge area into a spacious dinette for an impressive waterfront dining experience. Making your way inside the console you will find an standard head, convenient sink and pull-out shower complete with teak flooring and corian countertops. The locking console door provides a secure location to keep your valuables safe when you depart your vessel. The plush stern seating features ample storage that hides beneath the cushion and exotic marine textiles embellish the upholstery that clothe the cushions onboard. Behind the helm you’ll find a standard grand entertainment center packed with all the necessary components to ensure a great time out in the water. The spacious refrigerator provides cool place to store your delicate foods or bottles, while the stainless steel grill sizzles your favorite meal. The corian countertop with integrated sink offers a spacious work top.